During our camper holiday in Florida we spent a couple of lovely days on the Florida Keys. Even the road that leads to there is phenomenal (and a bit scary if you’re afraid of water). You drive for 205.2 km over the water with the Atlantic Ocean on one side and the Gulf of Mexico on the other. The many islands (keys) are connected to one another by bridges. The longest and most well-known bridge is the Seven Mile Bridge stretching 11 km. 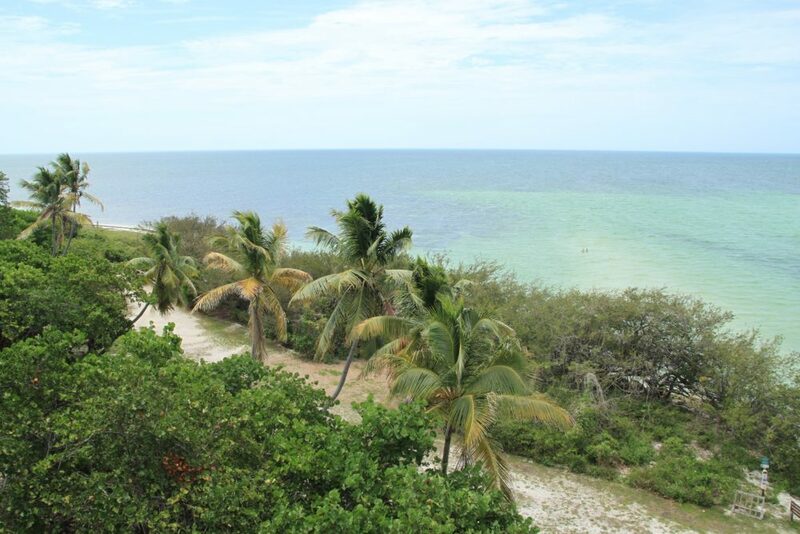 This beautiful drive is the perfect start for your holiday on the Florida Keys with kids. The keys have loads to offer and are just perfect for a couple of days of sun, sea and beaches! The vibe is slightly different to your “mainland America”, you know, just laid back and relaxed. And there is loads to do for kids too. 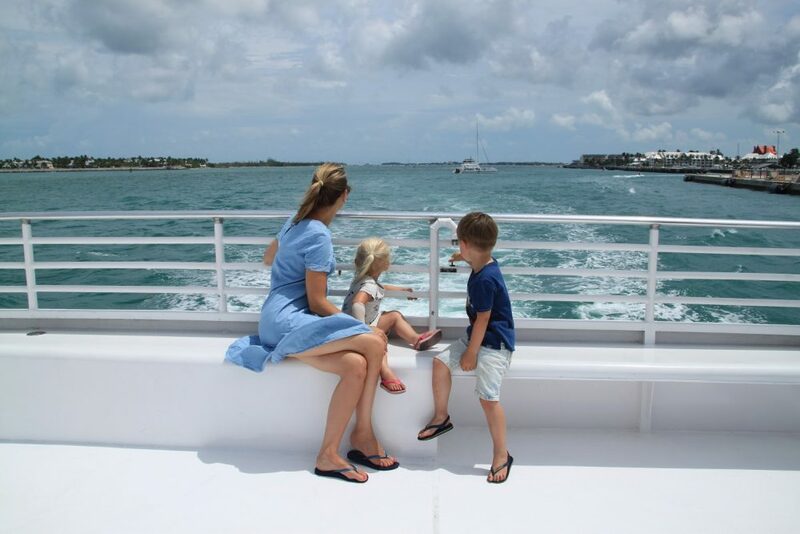 Are you going to the Florida Keys with kids? This Top 10 may come in handy! Highly favored by both the kids and me, but not so much by Kev as he got seasick… You get on this big boat in the harbor! There is a spacious deck where you can enjoy the sun and the view. 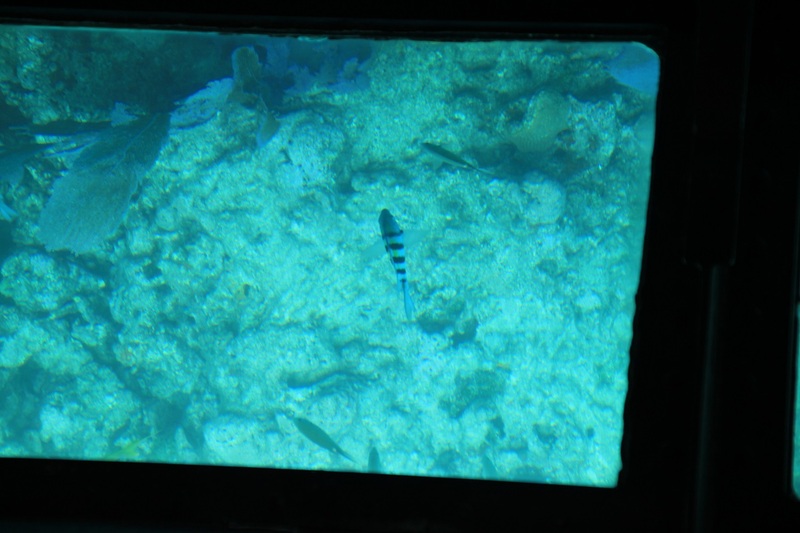 The boat takes you out off the coast to a reef where you can spot beautiful fish. After you’ve reached the reef the captain lays the boat still and everyone can go inside to watch the beautiful sea creatures through the glass bottom of the boat. It didn’t take long for Floris to spot “Nemo” and “Dora” and other “famous” little fish. The “Keys Deer” is a special kind of deer that can only be found on the lower situated keys. In the refuge you can get to know all about these special type of deer and perhaps even spot a few. But there is lots more to do. You can book all kinds of activities, from fishing to wildlife spotting or even photography courses. 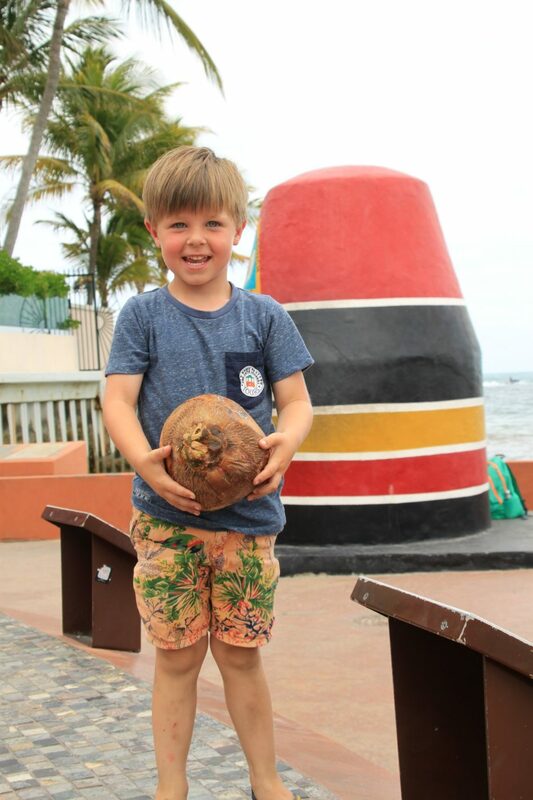 You simply cannot skip Mallory Square when you visit the Florida Keys with kids. Go and visit Mallory near the end of the day. Buy a bite to eat and a drink from the street vendors and enjoy yourself… On this square all kinds of street performers will amaze you with their dazzling tricks. Typically American so with lots of showmanship and loud noise, the kids enjoyed every minute of it. The juggler doing tricks with fire really left a big impression on Floris and Lotte. 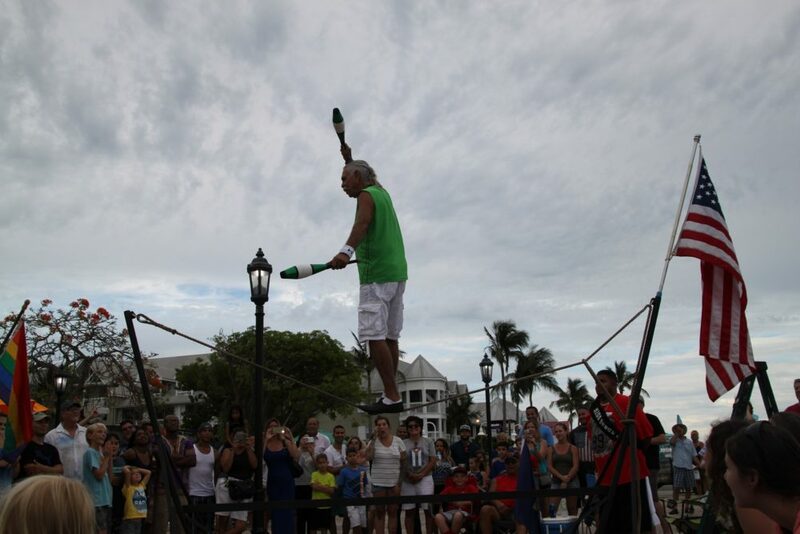 Not for the faint-hearted kids (or parents)… this tour shows you “the dark side” of Key-West. You’re taken on a trolley by a frightening guide that takes you on a tour through Key-West, telling you all about the ghastly legends and scary stories that roam this part of town. You need to be slightly tough for this one because feeding these gigantic fish is pretty exciting to say the least. When you arrive you buy a bucket of (dead) fish and walk to the harbor where the Tarpons love to be fed. 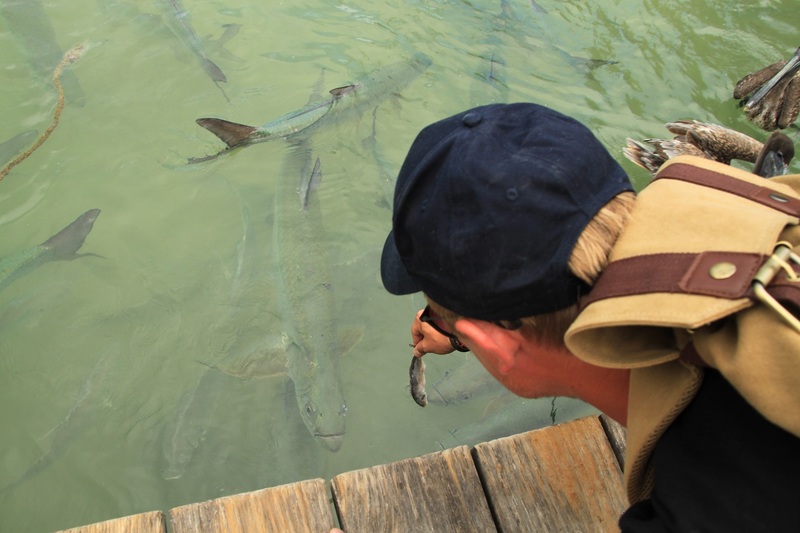 You can throw the dead fish in the water and watch how it gets devoured by the Tarpons or you can be a real hero… lay flat on your stomach and feed the Tarpons from your hand! Be aware that the Tarpons do have razor sharp teeth. The enormous Pelicans that are eagerly waiting to clean up any fish you leave lying around are quite a sight on their own. In the Dolphin Rescue Center you can get to know all there is to know about dolphins. In this research institute they study the behavior of dolphins. You can watch the dolphins during all kinds of sessions on which the “trainer” tells you a lot about these fascinating creatures. You can even test your knowledge in all kinds of interactive quizzes. Here you can find the most beautiful beaches of the Florida Keys and lots more! There’s an old railroad for instance, from where you have a spectacular view over the water. During our walk up there a black snake suddenly showed up right in front of us. I almost jumped onto Kevin’s shoulders in fright but Floris was very enthusiastic. Not so much fun for people with a snake phobia. In Bahia Honda State Park you can do all kinds of activities such as kayaking or snorkeling aside from swimming and hiking. A “real” hospital for turtles and you can pay them a visit! Because it’s a hospital where the animals get treated it’s only possible to book guided tours. The guide takes you on a tour through the hospital and shows you how the turtles are doing and how they get rehabilitated to continue a long and happy life on the Florida Keys. A perfect way to explore Key-west; the Conch Tour Train! This cozy little train puffs through the center of Key-West and stops at all the highlights and sights. During the ride the chauffeur talks about Key-West and its history. We got off at “The southernmost point buoy” and walked back through one of the many cozy streets where we just had to try a slice of the well-known lime pie. You can go on the most amazing snorkeling trips in this park. The underwater world is fascinating and certainly worth a visit. Are your kids too young of age to go snorkeling? You can explore the underwater life from a kayak or glass bottom boat if you like. And you can also fully enjoy the aquatic wonders through one of the many diving trips. We had a wondrous time on the Florida Keys with kids. Aside from all the fun sights the keys also have fantastic beaches, nice shops and lots of restaurants! If the Florida Keys weren’t on your bucket list yet they certainly should be now!